Our Clients are Financial Advisors. Our goal is to streamline back office administration freeing up time for advisors to see more clients. APPROACH takes care of the administrative needs of your clients and all the stress that comes with it. Assistance to financial planners in the preparation of all pre appointment planning – this service provides standardised summaries, spreadsheets, quotations and FAIS documentation required in the delivery of financial proposals. 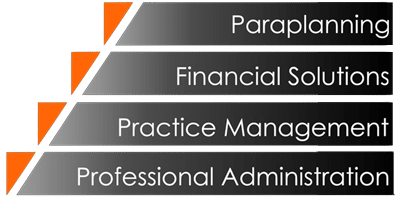 An experienced and critical administrative overview, streamlining the implementation of procedures – practice management assists with compliant record keeping, efficient document storage and best practice principals. Our core philosophy when approaching your practice is to always work smarter not harder. Assistance to financial planners in the completion of all post appointment work in both the servicing and new business field – this service combines initiative driven task management with the efficient get-the-job done attitude. We process any industry related application medical aid, life application, investment applications. We make section 14 transfers easy. Outsourcing is a concept that business professionals and enterprises around the world are adopting. Outsourcing provides your business with more experience and skilled assistance at an affordable rate. It is easy to implement with very little investment and training from your side. You get access to a team of professionals at a fraction of the cost. No employee headaches, training and additional office expenses. We offer assistance and support making you more productive while freeing up your time. Managing staff while still trying to grow a business is what many successful entrepreneurs have realised is one of the major pitfalls or barriers to success. Staff although after much energy, emotional support and extensive training can become ‘assets’ to your business many SME businesses are questioning the viability. An asset like an employee can take up so much of your time and energy and at the end of the day can still let you down and even worse just get up and walk away. Many could argue that in today’s world loyalty and the workplace are often not in equilibrium. Outsourcing does not guarantee loyalty but it does provide surety that you have professionals looking after your interests. As it is a contract if you are unhappy with your service provider you can simply change, no disciplinary action, no CCMA cases, no difficult emotions to manage. It is simply a professional service relationship. Many business owners and entrepreneurs have high aspirations and the shortfall is that staff very often don’t share this approach. With all this in mind the value of outsourcing begins to shine. No need for staff management, no stress of absenteeism, no complications with attitude and honesty and no worry of losing your experienced employee. All this becomes the responsibility of the third party providing the professional service. We at Approach take responsibility to always provide the best quality service. It is our responsibility to ensure the highest level of skills and experience. We are constantly scrutinising our team, our processes and our ability to provide the service so many Advisors have enjoyed for over a decade.